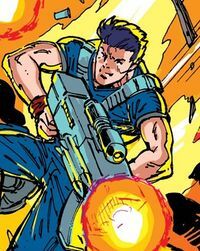 The name or term "Action Man" refers to more than one character or idea. For a list of other meanings, see Action Man (disambiguation). The Action Man of the 1990s! Fittingly for the hero of such an era, he is the leader of Team Extreme. This Action Man is visually based on the incarnation from the 1995 Action Man animated series. It is unclear if he is a young Mike Brogan or a separate individual altogether. This wiki assumes the latter.